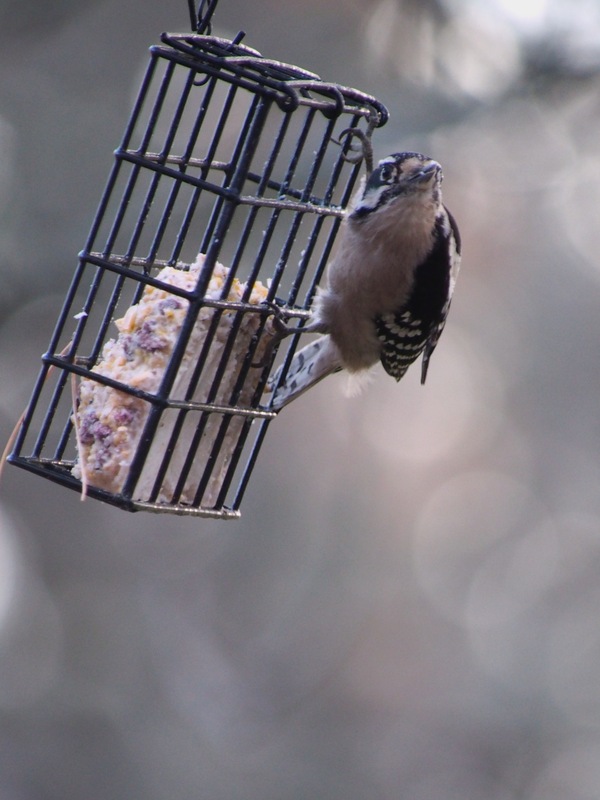 It was a glorious sunny 70+ degree day – perfect for Sunday Brunch at the Bird Feeder Buffet. 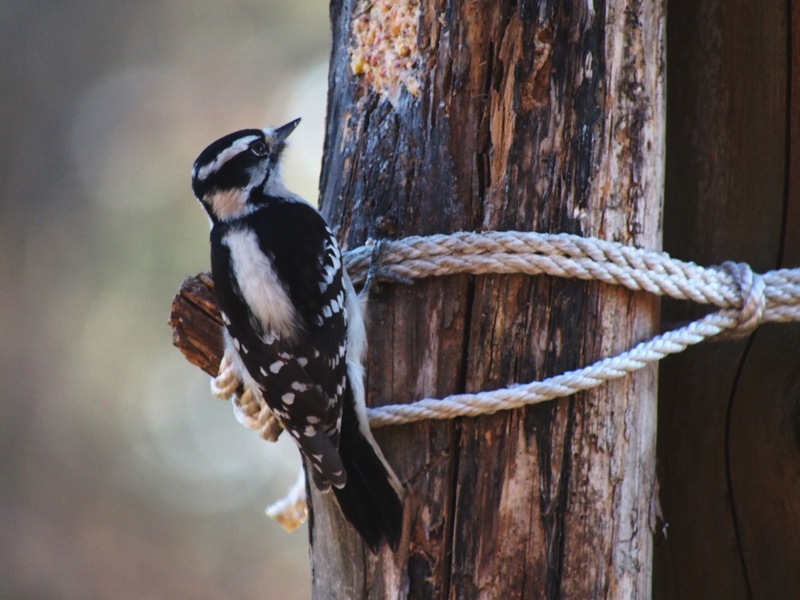 this weeks special – suet served up to shy woodpeckers. 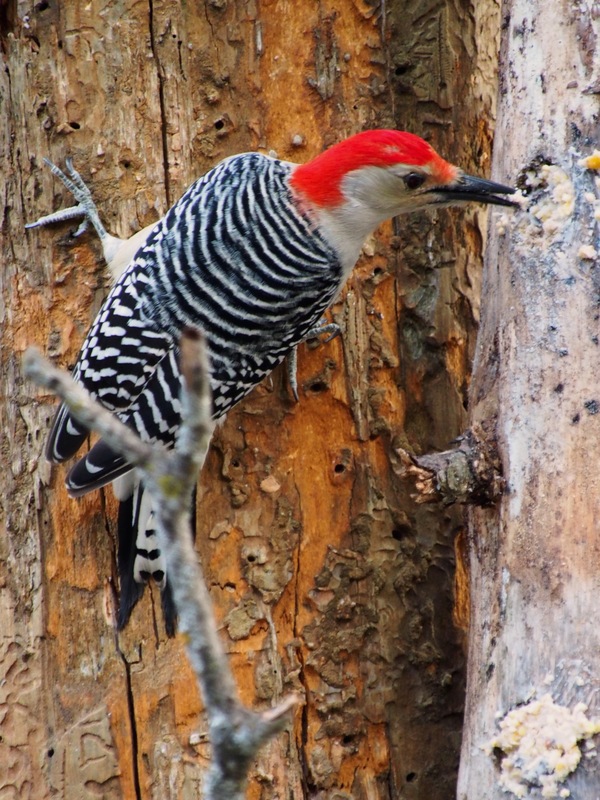 Woodpeckers are cautious and flighty. But, like most of my guests at the buffet, their appetite urges them onward in spite of their concerns. Interestingly, it seems that the females of the species are the trail blazers in this regard. 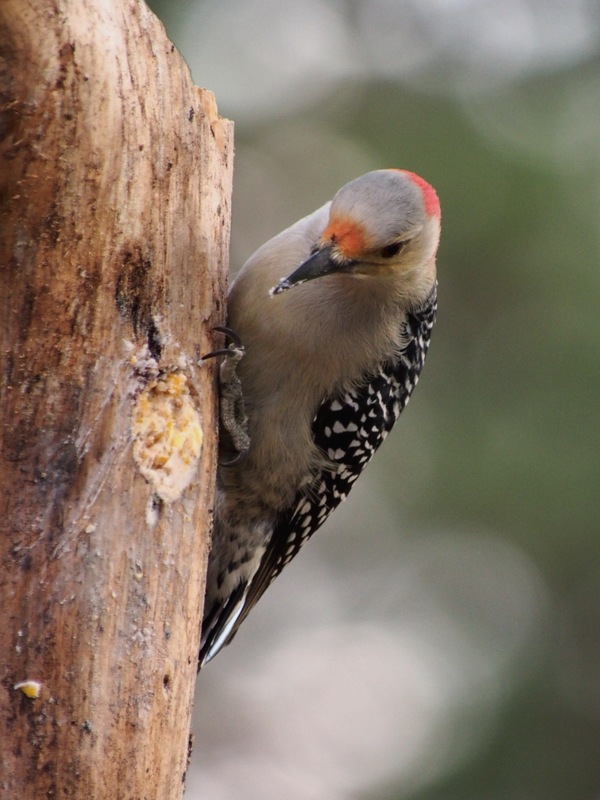 If you want to know more about these feeders check out my post on feeding woodpeckers here. She decides that I’m no threat and digs in. 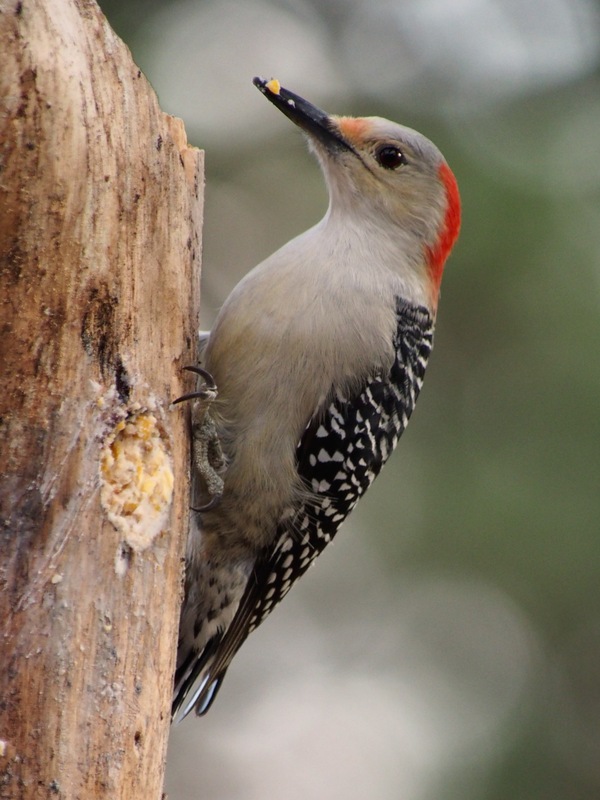 These feeders are perfect for woodpeckers. 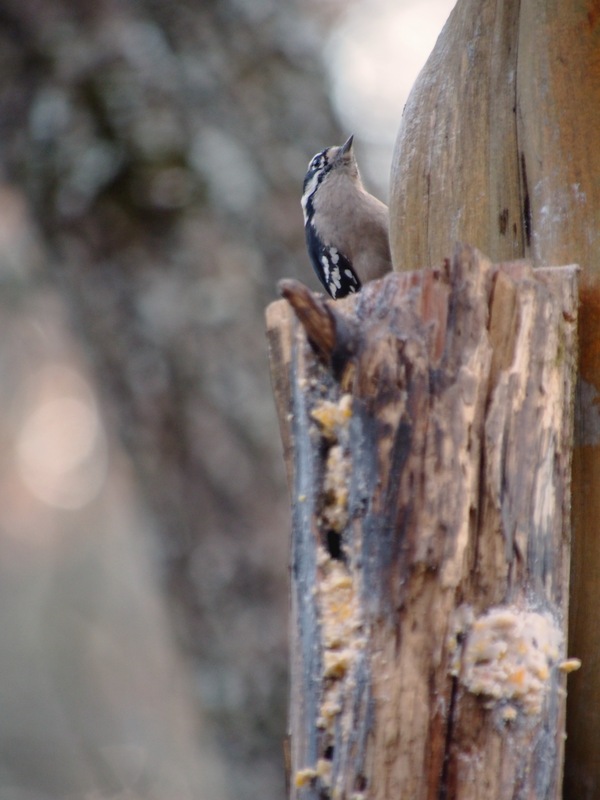 Very few birds have the ability to scale tree trunks, so with the exception of the nuthatches they have these feeders all to themselves. She’s followed a few minutes later by her mister. He’s been here before, but is skittish and shy, so shy that he tries to sneak around the log instead of just scaling it like his mate. A lot more work for him, but it allows him a better field of vision. On the other end of the buffer the downies are feeding. This female is a regular visitor and has almost no fear of me. I shot this from a rocker 6 feet from her. Her mate was spotted at the buffet for the very first time yesterday at Sunday Brunch. 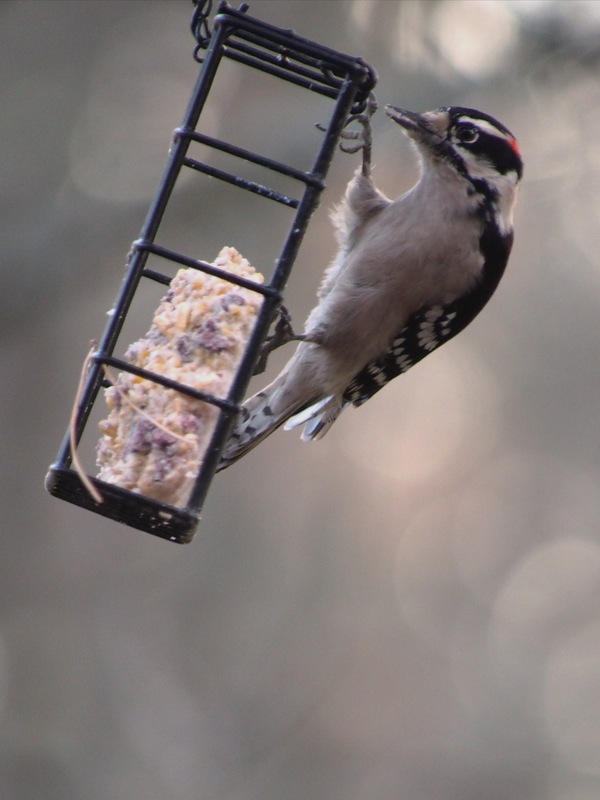 And decided to go for the suet feeder instead. We do our best to make our guests comfortable at the buffet, but sometimes a fella has to be prepared to eat and run. 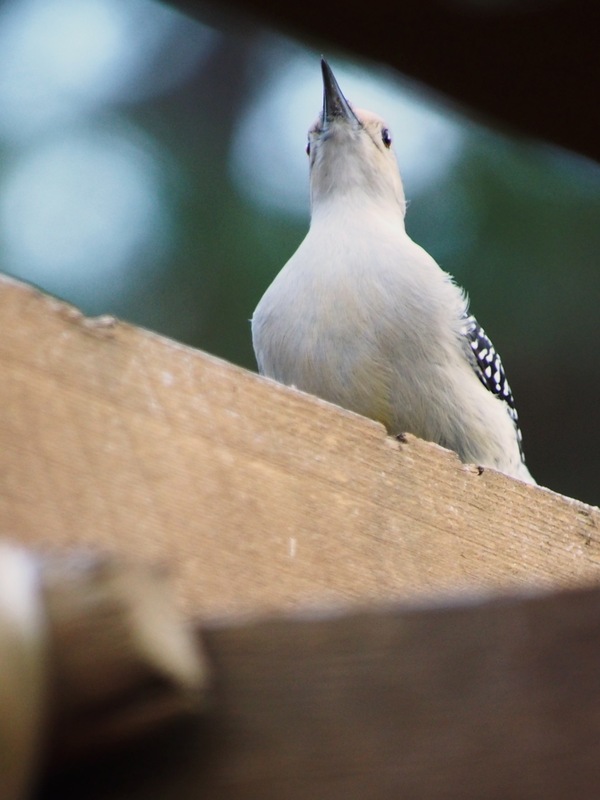 This entry was posted in birds, Ozarks, Photography, wildlife and tagged December, downy woodpecker, Olympus, Olympus E-M5, Ozarks, photography, Red-bellied Woodpecker, suet, Woodpeckers by artsifrtsy. Bookmark the permalink. I love your shots of birds. Great to see these birds from all angles so I can get an appreciation of their attractive feather patterns and detail. Thanks Vicki – I have become very fond of these guys. They wait in the nearby tree for me to fill their feeders. Thanks! It has been amazing – looks like it will hold out through the weekend! Yep….hanging on til Sunday nite! 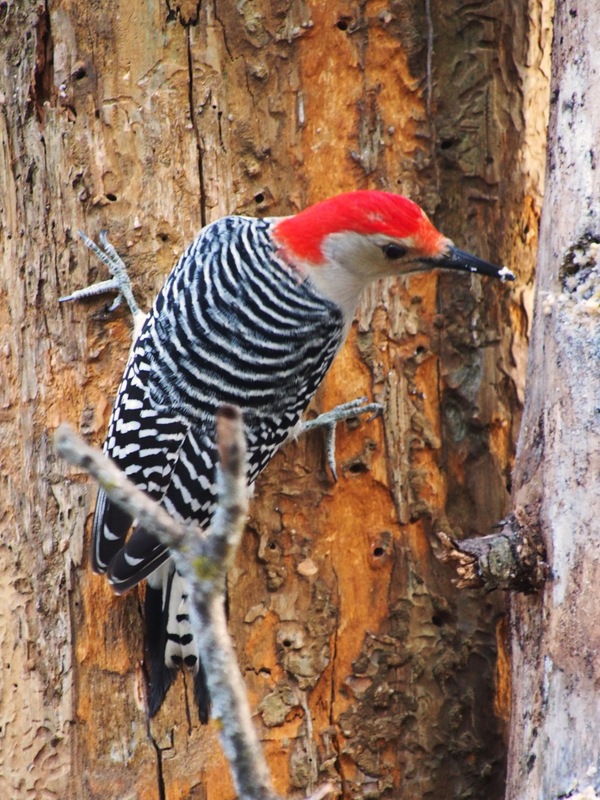 We have tons of woodpeckers here in central VA. 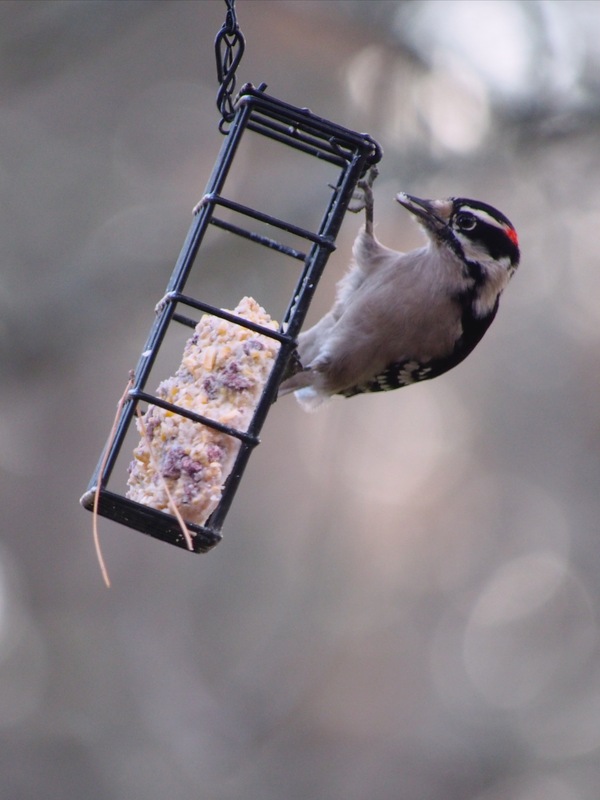 The pileateds are my favorite, but they are way too shy to come to the feeders. Downies are the funniest because, to me, they remind me of Charlie Chaplin, the way they kind of shuffle stiffly from side to side and peek around corners. The male downey in this post is the first I’ve seen. I have a couple of females who are completely unconcerned with me and they really like that log feeder. 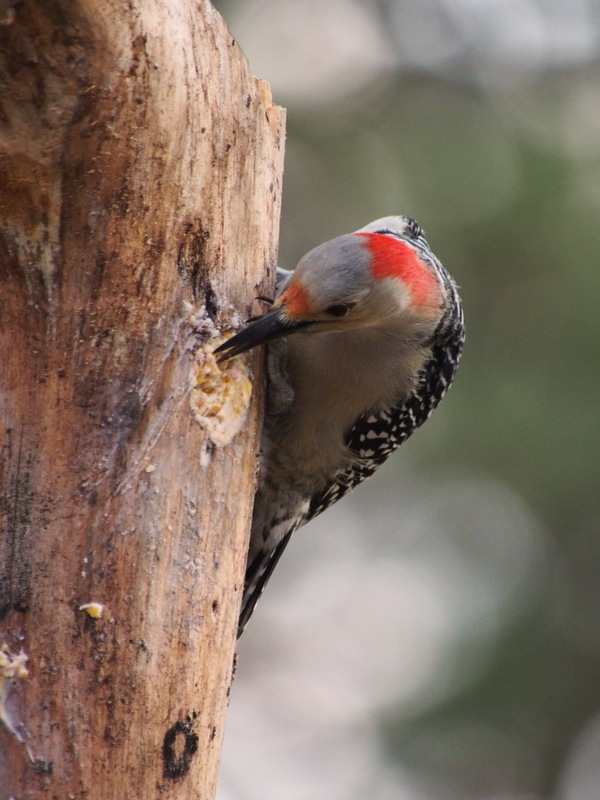 I have a neighbor who has attracted a pileated to a log feeder, but it wasn’t as close to the house as mine are. I love those, gorgeous birds. I have shot a couple in my walnut tree. Amazing shots! 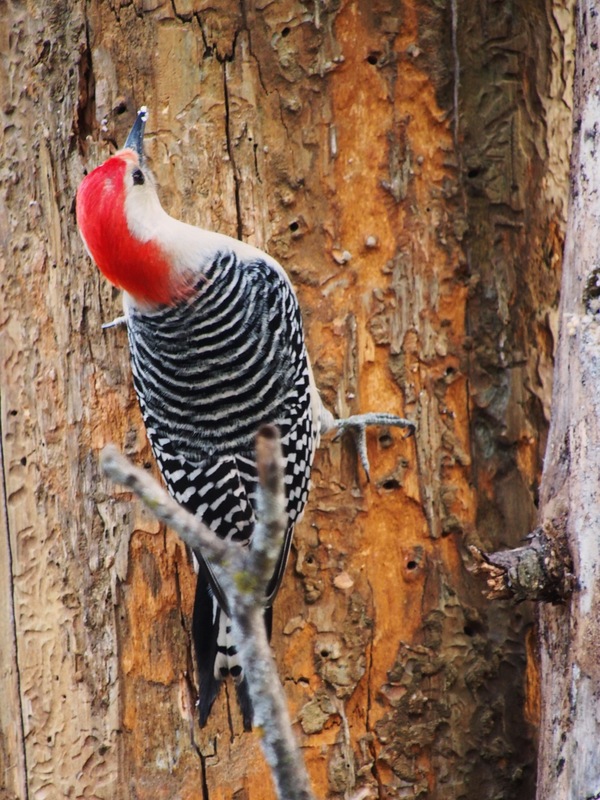 Your woodpeckers are beautiful and stylish compared to the desert peckers. 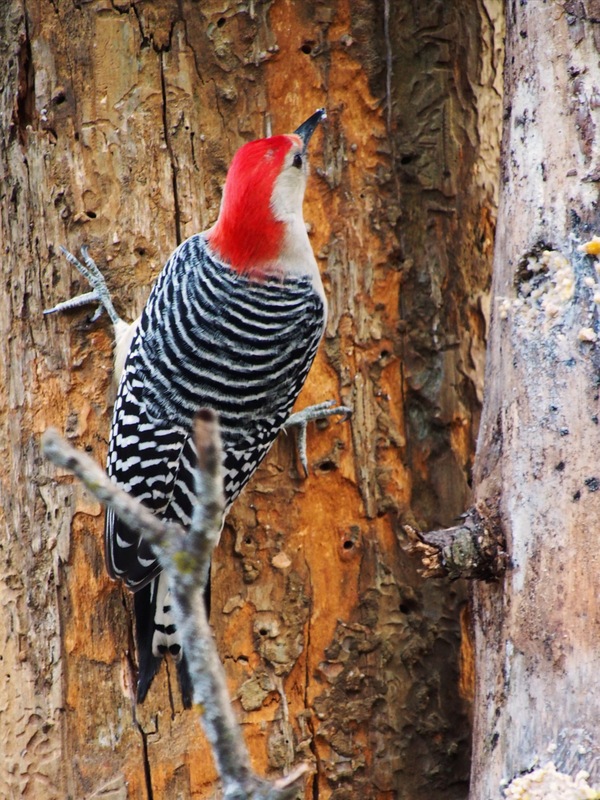 Thanks so much – I don’t recall seeing woodpeckers in the desert. I likely never noticed them. I think they are such fascinating birds. Only 65? Yeah forget it – I won’t be moving in. 😉 Glad you are having gorgeous weather! I was being sarcastic haha I would seriously jump in a pool if it was suddenly 65 here! But you do have a dog named Velcro:) Thanks Elyse – I love these guys, especially the red bellies. Is that what you have there? We have red bellies and downy mostly. There are lots of pileated but they don’t come to the feeders. And it drives me crazy that the red bellies are called red bellies — couldn’t they be called “Not quite as red-headders”? I know – it’s a silly name – they have reddish hats, not bellies. I think they look like they are wearing an ugly Christmas sweater. They look like houndstooth sweaters – not so stylish with those red hats. 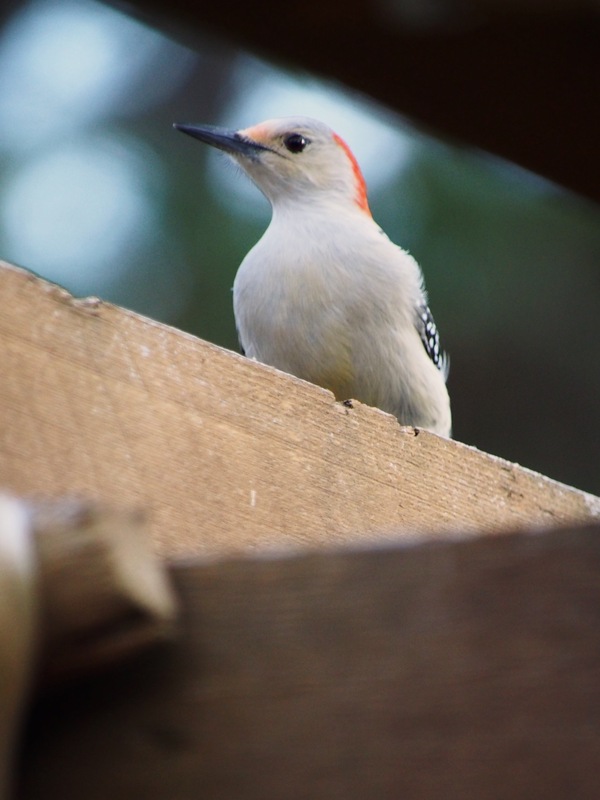 We don’t have any woodpeckers here, but when we lived in NC, oh man! they sounded like a jackhammer. These are so beautiful. I love them, such beautiful birds. I don’t mind the drumming as long as it’s not next to the bedroom. Beautiful Captures – thanks for sharing! 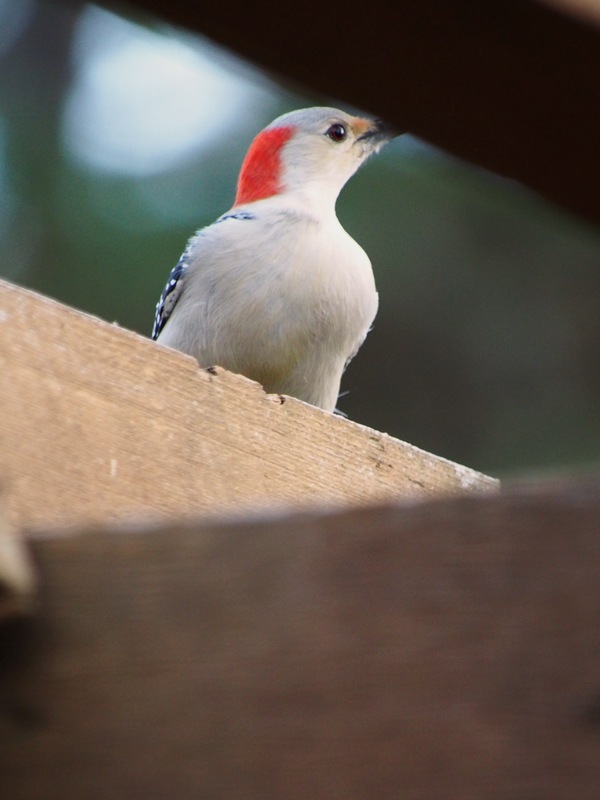 I love woodpeckers – ours are persistent, never giving up on tapping on our sad cedar deck or our steel house siding! These pictures are gorgeous – I envy your awesome bird traffic!